Lithium Pros’ batteries use lithium, which is lighter than lead-acid and packs more power. 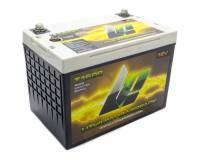 Our batteries deliver higher power during cranking, and hold a higher voltage during discharge than a comparably sized lead acid battery. That means a hotter ignition, faster starts, and more watts for your accessories. Lithium Pros is a group of automotive enthusiasts who are focused on bringing the highest performance, ultra lightweight lithium-ion batteries to the racing, EV, marine, fleet, and specialty markets. Our team is made of up SPL, SQ, drifting, drag racing, motorcycle, and off-road competitors as well as some talented engineers, chemists, and machinists. We are constantly looking for ways to make batteries lighter, more powerful, and more durable. We uniquely balance high performance and reliability with reasonable cost to make for the best value in a high performance battery. Lithium Pros was established in March 2011. However, in a sense, we are not new to racing. The management team here has been involved with racing for over 20 years, developing Powermaster™ from its inception as well as XS Power™. From the beginning we have had a technological edge over our competitors because of our strong commitment to product testing. As has been said in NASCAR, “all the BS stops at the dyno.” The same is true for high performance batteries. We have an in-house testing lab, we employ the services of outside accredited labs, as well as outside experts to insure we bring you the best. When we put a label on a product you can count on it. When we put a warranty on a product, we have years of experience in backing it up. Lithium Pros has already been the battery of choice for many forms of racing and continues to add winners every weekend. Be assured that what is learned in the harsh environment of the track makes its way into everything we do. Do you have a custom or unique application and you don’t see a part number for it? Call us and we may be able to custom manufacture a lithium battery pack for you right here in East Tennessee. Because the lithium powering Lithium Pros’ batteries produce more pound-per-pound power than lead-acid, less material are needed. The result is a lighter battery. In fact, some models are so light they float making them ideal for racing and marine activities. 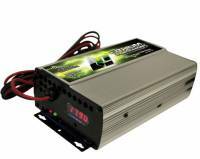 Lithium Pros’ lithium-ion batteries accept charge current up to 5x faster than lead-acid batteries, and in many cases Lithium Pros’ batteries recharge in less than an hour. Lithium Pros’ lithium-ion batteries provide over 5x the cycle life at 80% DOD (depth of discharge) compared to standard lead-acid batteries, and easily handles 2,000 cycles. Lithium Pros’ batteries are 96% efficient at converting input energy into stored energy (vs. about 75% for lead acid). Lithium Pros’ lithium-ion batteries do not contain toxic materials (lead/acid), or emit harmful gases like standard lead-acid batteries. 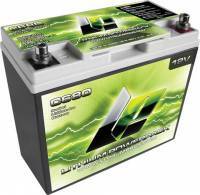 Also, our batteries use Lithium Iron Phosphate which is the safest form of lithium chemistry.